China's lunar probe Chang'e-3 touched down on the Moon on December 14, 2013 at 9:11 pm Beijing Time (8:11 am EST). Its rover called Yutu (Jade-Rabbit) is now poised to begin a three-month mission to explore the lunar rocks and soil in a 3 km2 area. The landing coordinates reported by the Beijing Aerospace Control Center [link] are 19.51W, 44.12N, in northwestern Mare Imbrium (see images below). On December 24, 2013 NASA's Lunar Reconnaissance Orbiter Camera acquired a beautiful series of six LROC Narrow Angle Camera images showing Chang'e-3 and Yutu on Mare Imbrium, see Chang'e-3 Lander and Rover From Above, from NASA/GSFC/Arizona State University at the LROC News System. 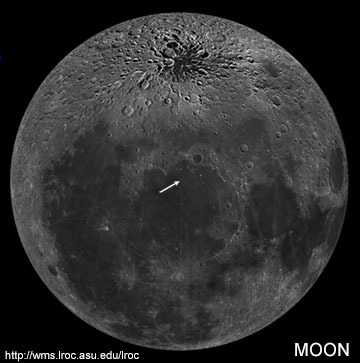 [LEFT] Global perspective: This Lunar Reconnaissance Orbiter Camera WAC global view of the Moon is centered on 19.51W, 44.12N, the Chang'e-3 landing site (arrow). Click on the image to go to the source-interactive webpage from LROC at Arizona State University, which has zoom and scroll options. [RIGHT] Local perspective: LROC WAC image (50 meters/pixel] of landing site (arrow) showing tonal variations of basaltic lava flows in this region of Mare Imbrium. Click on the image for an enlargement. As of the time of the December 17, 2013 press briefing by members of the Chang'e-3 science team, six of the eight instruments deployed to the Moon were operating. See Emily Lakdawalla's post at the Planetary Society [link] for an excellent overview of the transcript from the briefing. The rover has an alpha particle X-ray spectrometer, visible/near-infrared imaging spectrometer, a ground penetrating radar, two panoramic cameras, and navigation/hazard avoidance cameras. The spectrometers will provide data on the elemental composition and mineralogy of surface samples and the radar will probe the subsurface (potentially down to 200-300 meters) revealing profiles of the structure and depth of the regolith and underlying basalt layers. In anticipation of the new data expected from the instruments on Yutu, we present a glimpse at the mare basalts and their titanium variations gained from remote sensing and laboratory analyses of Apollo samples and lunar meteorites. Cosmochemical perspective: Titanium (TiO2) map of corresponding area to the righthand image above. 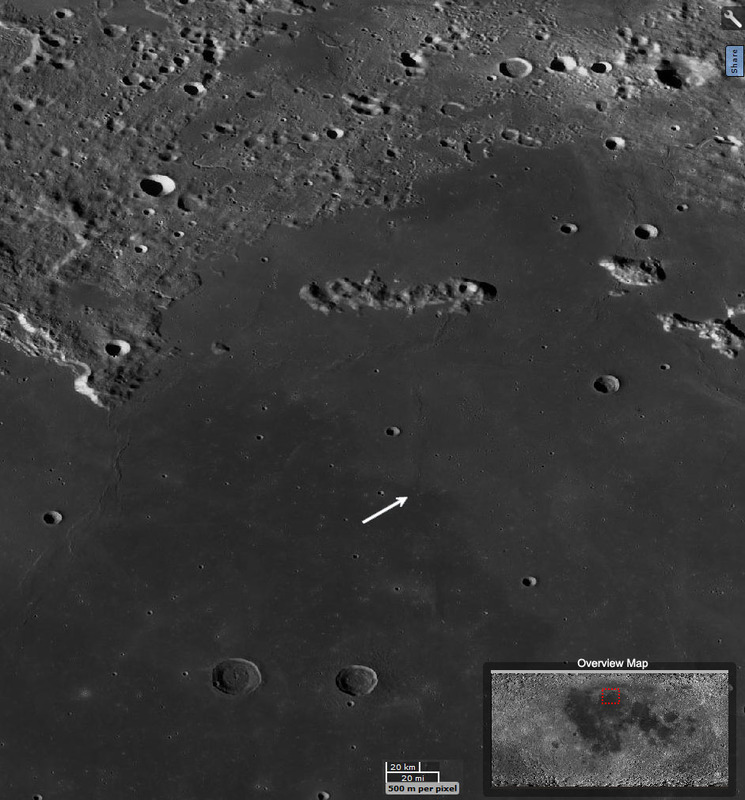 Chang'e-3 landing site is shown by black + symbol. Data are from the 2003 global map by Jeffrey Gillis-Davis (formerly at Washington University, now at the University of Hawaii, and colleagues; see reference list) using Clementine ultrviolet/visible data with 0.5 degree/pixel resolution. Mare Imbrium has sequences of long basaltic lava flows that flooded the basin. Paul Spudis (Lunar and Planetary Institute, Houston, Texas) has an excellent, illustrated write-up about the young flows (with an estimated age of 1 to 2.5 billion years old) at and around the Chang'e-3 landing site. See his blog post: A New Site to Explore on the Moon. Significantly, the compositions of the surface lavas provide information about the composition and mineralogy of the lunar mantle, where the material originated. Titanium, in particular, which occurs in the mineral ilmenite (FeTiO3), has been used for classifying lunar basalts since the 1970s and provides a probe into the geochemical workings inside the Moon. On the left we show a TiO2 map created with Clementine UVVIS data with 0.5 degree/pixel resolution that shows spectrally distinct surfaces. The landing site (at the + symbol) is on a flow with higher titanium abundance than (and close to the boundary with) flows to the north. This is only one example of titanium abundance maps that have been created for the Moon, others have been derived from Lunar Prospector gamma-ray spectrometer orbital data, SELENE (Kaguya) Multiband Imager orbital data, Moon Mineralogy Mapper–M3 orbital data, and Chang'e-1 Interference Imaging Spectrometer orbital data (see reference list). 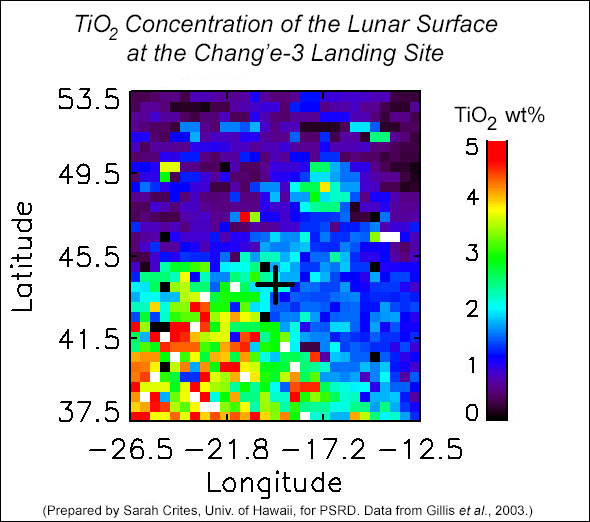 Depending on the spectral data and algorithm used to calculate TiO2 concentration on the lunar surface (see reference list) the values in the landing area seem to be in the intermediate range (up to ~5 wt%). In these maps, the TiO2 values are likely influenced by overlying regolith, which is a complex mixture that tends to give lower TiO2 values than basaltic rock (~20% lower on average, see Gillis and others reference below) and by the high iron contents of the basalts. In concert with the remote sensing efforts, laboratory analysis of titanium and other element concentrations in Apollo samples and lunar meteorites are providing ground-truth correlations for the elemental abundance maps (see reference list). How exciting it will be to have Yutu's instruments analyze multiple lava flows around the landing site, giving us the first ever on-location, ground-truth look at these young basaltic rocks. The variations in titanium in these young lavas are being used to tell a story of magma melting and migration in the early Moon (see PSRD articles: The Surprising Lunar Maria and Recipe for High-Titanium Lunar Magmas). The new in situ data from the Yutu rover will be of great interest to researchers' ongoing efforts to identify and map variations in basaltic compositions and eruption sources in the quest to better understand the volcanic history of the Moon. As of the posting of this report on December 30, 2013 Yutu and the Chang'e-3 lander are in a planned sleep mode during local lunar night. Daybreak will occur after New Year's Day, so we will pick up the story and see you again in 2014. · In Pictures: Chang'e-3 soft-lands on Moon, picture gallery from Xinhuanet News. · Chang'e-3 Lander and Rover From Above, images from NASA/GSFC/Arizona State University at the LROC News System. · Spudis, P. D. (Dec. 15, 2013) A New Site to Explore on the Moon, The Once and Future Moon Blog at Air & Space, Smithsonian Media. http://blogs.airspacemag.com/moon/2013/12/a-new-site-to-explore-on-the-moon/. · Taylor, G. J. (Dec. 2000) Recipe for High-Titanium Lunar Magmas, Planetary Science Research Discoveries. http://www.psrd.hawaii.edu/Dec00/highTi.html. · Taylor, G. J. (June 2000) The Surprising Lunar Maria, Planetary Science Research Discoveries. http://www.psrd.hawaii.edu/June00/lunarMaria.html. Written by Linda Martel, Hawai'i Institute of Geophysics and Planetology, for PSRD.